Looking back on Saturday's Rally to Restore Sanity in Washington, D.C., it isn't hard to see who laid out the money to bring the event together. Comedy Central and Busboy Productions, Jon Stewart's production company, footed the bill for a massive gathering that featured high-profile musical acts, top-notch production values, and a well-staffed safety infrastructure. Ariana Huffington's decision to fund free rides for New Yorkers led to 212 bus rentals, and The Onion's special edition for the event incurred printing and production costs. But while the not-so-free publicity value of the event should be a bonus for the participants, it's likely that Stewart and company will measure their own gains in terms of power and influence, not cash. 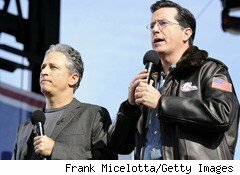 Still, for some participants -- such as the the hundreds of vendors selling unlicensed pins, T-shirts and memorabilia -- the rally was lucrative in monetary terms, but Stewart and Colbert ensured that at least some of the day's dollars went into the pockets of their favorite charities. For these groups, the show proved highly profitable, both in terms of increased donations and in the elevation of their public profiles. And most unusually, one of the rally's biggest beneficiaries was the National Mall itself. Stretching from the Lincoln Memorial to the U.S. Capitol, the 700-acre expanse of parkland has been called "America's Front Yard," and attracts an estimated 25 million visitors each year -- more than Yellowstone park, Yosemite and the Grand Canyon combined. Unfortunately, those many millions of footsteps leave a lot of wear and tear, and the mall needs an estimated $350 to $500 million in repairs. Currently, its annual budget from the National Park Service is an anemic $31 million. As part of the Rally to Restore Sanity, Jon Stewart urged his audience to contribute to the Trust for the National Mall, a nonprofit group that raises money for the green space. Courtney Cohen, a representative of the Trust, told DailyFinance that the huge park issues permits for 3,000 events per year, and all of them leave a mark, including "broken fences, litter, and other forms of damage." While many organizers help reimburse the National Park Service for cleanup, Cohen notes that this is the first time that the Trust has been the designated recipient of funds generated by an event. According to Cohen, the Trust's staff was surprised at Stewart's decision to promote it: "In the last week of September, one of our junior staffers got a call from Jon Stewart's production company, Busboy Productions. At first, the staffer thought it was a joke." Even now, the Trust is surprised at Stewart's decision to single them out. "The Trust's president, Caroline Cunningham, jokes that The Daily Show found us on Google," Cohen laughs. Regardless of how Stewart found the Trust, the event has brought donations pouring in. "On Oct. 6, when Jon Stewart made an announcement on The Daily Show, donations started coming in at a regular pace," Cohen remembers. "Last week, they topped $100,000, and right now, they are over $188,000." The trust hopes that the ultimate tally from Stewart's call to arms will be close to $200,000. Cohen notes that the funds will be used to "support the Trust's mission to improve and restore the National Mall." Among the immediate priorities are monument upkeep, repairs to basic infrastructure, and the development of a circulation system for the Mall's waterways. In recent years, some of those waterways have gone from poorly maintained to outright toxic: Stagnant water in the Capitol reflecting pool become a breeding ground for avian botulism that killed dozens of ducks. Stephen Colbert's designated charity, Donors Choose, became the cornerstone for his own involvement in the rally. An organization that allows contributors to give directly to school-related projects, the Donors Choose website caught the attention of Colbert, and he became a member of its board of directors in 2009. Since then, he has repeatedly inspired his viewers to contribute to the group by sponsoring special "challenges." When it came to the rally, however, Colbert's fans turned the tables on the television star. In an attempt to get him to commit to the joining show, they issued their own challenge. Donors Choose wasn't aware of the plan until money started pouring in. According to marketing manager Anna Doherty, "In the middle of September, we noticed that there was a page on our site where donors were channeling funds. To convince Colbert to set up a rally on the mall, they set a goal of raising $101,010 in one month. They hit their mark in 24 hours," she laughs. "They changed the goal to $500,000. Right now, they're at $540,000." Although Colbert was pulled into the event, he quickly put his own spin on it. As he announced on his Oct. 5 episode, "Make your donation to show support of my march and to support America's kids. And keep those donations coming folks, because for every $100,000, I undo another button." Extending their involvement with the event, Donors Choose also set up a tent on the Mall, where they handed out thousands of gift cards to prospective donors. The Trust for the National Mall did the same, giving audience members postcards made out of recycled paper and impregnated with grass seed, so that they would benefit the Mall, even if they were simply thrown to the ground: Wherever they fell, the cards would decompose, and reseed a small patch of America's Front Yard.